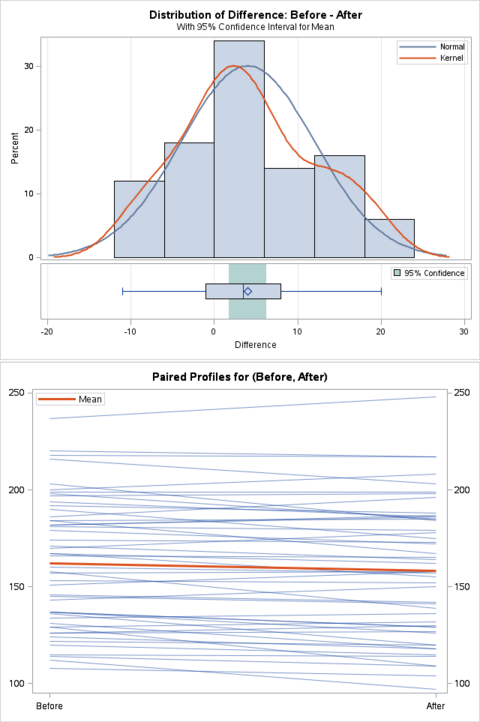 A paired t-test can be used to compare the means of two populations where the observations come in pairs. It is often used when comparing the "before" and "after" results. A weight loss product claims to have a significant effect on helping people lose weight. An independent committee has conducted an inspection and selected 50 healthy participants who have used this particular weight loss product. Their weights were measured before and after they have used the product and the results are captured in the INSPECTION data set above. where d = before - after. The paired t-test can be done by using Proc ttest with the PAIRED statement. The PAIRED statement should list the two paired variables separated by an asterisk (*). 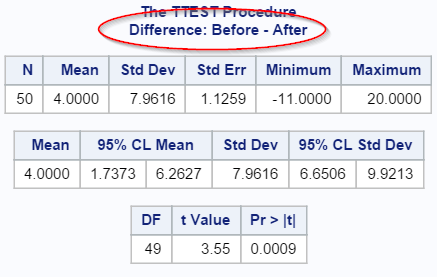 Some basic statistics are generated for the difference between the before- and after- results. The average weight loss is 4 lbs after using the weight loss product. The 95% confidence interval is [1.74, 6.26]. We are 95% certain the actual weight loss is between 1.74 to 6.26 lbs. 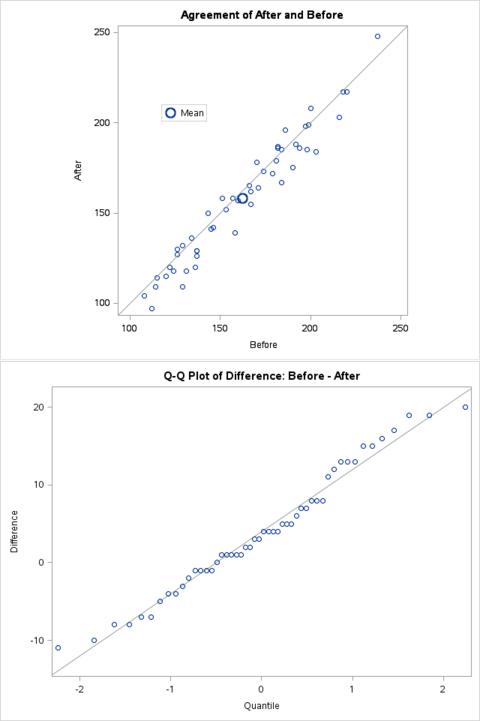 This rejects the null hypothesis that the difference in weight loss is zero (no effect). 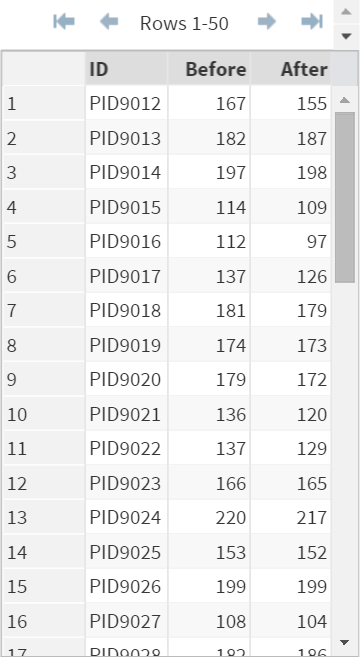 The p-value of 0.0009 also rejects the null hypothesis. Looks like the weight loss product is indeed effective. The linear pattern from the q-q plot suggests the difference is normally distributed. The GROUPON data set contains a list of restaurants who have launched a groupon marketing campaign. A study is conducted to find out if the groupon campaign is profitable for the restaurants. Perform a paired t-test to compare the total profit before and after the groupon campaign. Is the campaign profitable for the restaurants?